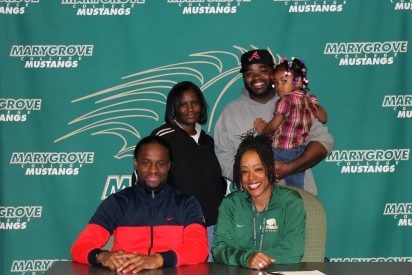 DETROIT, Mich. — The Mustangs Track & Field program picked up their first official signing of the 2012 class after receiving a commitment from Lovell Walker, Jr. The talented incoming freshman will join a roster that ended the 2011 season on a high note and is poised for a breakout 2012 season. Walker, a 5’6″ all-around athlete, hails from Detroit’s Allen Academy where he starred in the 4×100, 4×200, 4×400, 4×800, 400, and 800. The depth in events will help the Mustangs as they look to accomplish their goals during the 2012-13 indoor/outdoor seasons. Of those events, Walker was a state qualifier in the 4×100 last season for Allen Academy. The solid season helped the senior earn All-State, All-Conference, and regional honors to end his career. A member of the Motor City Track Club, Walker helped lead the Motor City 4×800 team into Norfolk, VA for the 2010 AAU Championships where the team earned a third place finish. Walker also played two years of football and one year of basketball at Allen Academy. At Marygrove, the National Honor Society member will keep his focus in the classroom as he eventually wants to pursue a career in athletic training. Coach Womack on Walker: Lovell is a great addition to our program. He is an all-state level competitor that has the ability to have a successful career at the collegiate level. Lovell has plenty of family support and has the character we are looking for within our growing program. I look forward to coaching Lovell and the rest of the team next season.